Royal Australian Navy frigate HMAS Ballarat, deployed in the Middle East as part of Operation Manitou, took part in a successful anti-narcotics operation in the Arabian Sea. More than 2 tonnes of hashish and 345 kilograms of heroin worth over $200 million dollars were seized in two separate boarding operations. A new Pentagon report reveals that the US Navy’s new aircraft carrier, USS Gerald R. Ford, experienced several critical failures of its launch and arresting gear during sea trials. Two years after its delivery, the ship is still plagued by reliability issues affecting its new EMALS (electromagnetic aircraft launch system). The Pentagon has also reportedly identified problems with the navy’s P-8A Poseidon aircraft. The P-8A’s ability to conduct intelligence, surveillance, and reconnaissance operations has been hampered by reduced aircraft availability and sensor deficiencies. In South Asia, Sri Lanka’s SLNS Sayurala has left the port city of Colombo to take part in Pakistan’s AMAN 2019. More than 40 countries including the US, China and the UK are expected to take part in Pakistan’s biennial multinational maritime exercise in Karachi. French shipbuilding companies Chantiers de l’Atlantique and Naval Group have signed a €1.7 billion contract with the EU’s Organisation for Joint Armament Co-operation to design and build four logistic support ships. The tankers will have a fuel capacity of 13,000 cubic metres and will be used by the French Navy to support its blue-water operations. The Royal Australian Air Force has sent eight aircraft and 370 personnel to participate in the US Air Force’s Red Flag joint military training at Nellis Air Force Base in Nevada. The UK is also participating in the air combat exercises, which started on 29 January and will wrap up on 16 February. The RAAF’s role includes running an Australian task group headquarters and training participants on reconstructing a modern battlespace. Sabre-rattling continued in the East China Sea as the United States sent B-52s on a ‘routine training’ exercise near Okinawa Prefecture last week. The US says it remains committed to ensuring freedom of navigation and defending Japan under Article 5 of the US–Japan Treaty of Mutual Cooperation and Security. The move came just two days before the latest round of US–China trade talks were scheduled to start. US and Japanese military exercises around the disputed Senkaku/Diaoyu Islands are viewed as ‘provocative’ by the Chinese government. A Russian Air Force pilot has released a video displaying a Russian Su-27 banking against a US F-15C. The close encounter is thought to have taken place above the Baltic region, where US aircraft have been supporting the NATO Baltic air policing mission. This action continues what American officials describe as Russia’s ‘aggressive maneuvers’ against foreign aircraft in areas surrounding Russia and echoes previous actions by Russian fighter jets over the Black Sea in 2018. Soldiers in the US Army will be given pocket-sized drones that can fly covertly over a battlefield and send video and images back to the operator. 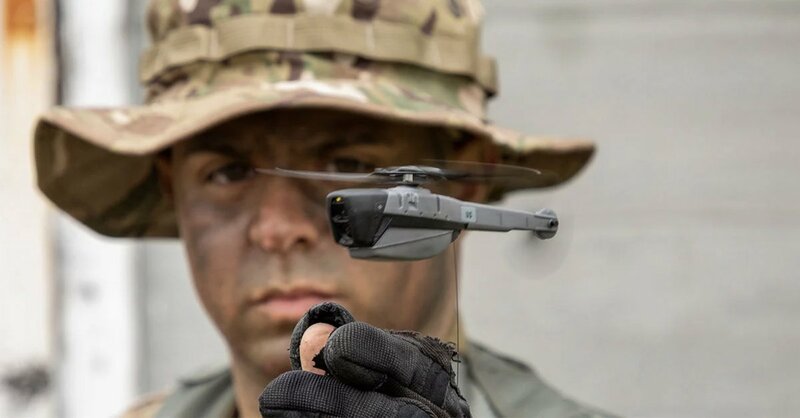 The army signed a US$39.6 million contract with FLIR Systems to provide the Black Hornet personal-reconnaissance drones, which can fly day or night up to nearly two kilometers, for nearly half an hour. It’s believed the personal drones will give soldiers a ‘lethal edge over enemies’. The British Army is also exploring innovative new technology, allowing soldiers to undertake virtual reality training in a new pilot program. Participants will train in a range of complex settings that are difficult to construct on the ground, such as an urban firefight or a building filled with enemy soldiers. Indian media reported that the Indian Army’s ‘Cold Start’ doctrine would be war-gamed this month, with on-the-ground exercises planned for May. Cold Start is a limited conventional war strategy that involves placing many nimble, integrated units close to the border to perform shallow incursions into Pakistani territory. In theory, the strategy will allow India to strike Pakistan quickly without risking nuclear retaliation (like a deep attack into Pakistani territory likely would). Questions remain, however, over India’s capability to execute Cold Start. Pakistan’s Inter-Service Public Relations office has released a video showing the launch of four ‘Nasr’ missiles, claiming that Pakistan conducted a successful training launch of the short-range surface-to-surface ballistic missile. The missile can carry a small tactical nuclear warhead, though it’s not clear whether Pakistan has developed such a warhead. There’s little doubt that the Nasr is designed to complicate India’s Cold Start calculations by signaling to India that even shallow incursions could trigger a nuclear response. SpaceX’s Starhopper, a spacecraft intended to test systems for the SpaceX Starship, has faced a serious setback. At the SpaceX base in Texas in late January, high winds caused significant damage to the nose cone of the Starhopper. Initial flight testing could be delayed by several weeks. The European Space Agency is partnering with aerospace company ArianeGroup to investigate the potential for extracting water and oxygen from the lunar surface to support human habitation and exploration on the moon. The project will start with a one-year contract to establish the feasibility of such an endeavour. If it’s deemed viable, a mission will be conducted before 2025. After a number of weeks in lunar night, China’s Chang’e 4 spacecraft came out of hibernation on 29 January. Earlier in the month, Chang’e 4 made history as the first spacecraft to land on the far side of the moon. Since its reawakening, data has been received indicating that the far side of the moon is colder than previously thought. In the coming months, Chang’e 4 is expected to deliver new insights into an untraversed landscape. Facebook has announced that it will ban foreign electoral ads and limit the spread of fake news during the Thai election period. In March, Thailand will hold its first elections since the 2014 military coup. Facebook is one of the most popular social media sites in Thailand, with more than 50 million users recorded in the country. Russian hackers have claimed that they stole evidence from Robert Mueller’s investigation into Russian interference in the 2016 US elections. US prosecutors allege that the evidence was stolen from a Russian company and leaked online to spread disinformation about Russia’s election propaganda campaign. Internet access in Tonga has been restored after a connectivity blackout that lasted 12 days. On 20 January, an underwater cable was severed in two different locations, causing the island nation to be almost completely disconnected from the outside world. This week, a director from the company responsible for Tonga’s underwater cables said sabotage has not yet been ruled out. Luke Courtois, Rhys De Wilde, Mali Walker and Genevieve Feely are research interns at ASPI. Image courtesy of FLIR on Twitter.